When you logged into LinkedIn around this time last year, you may have noticed something different. 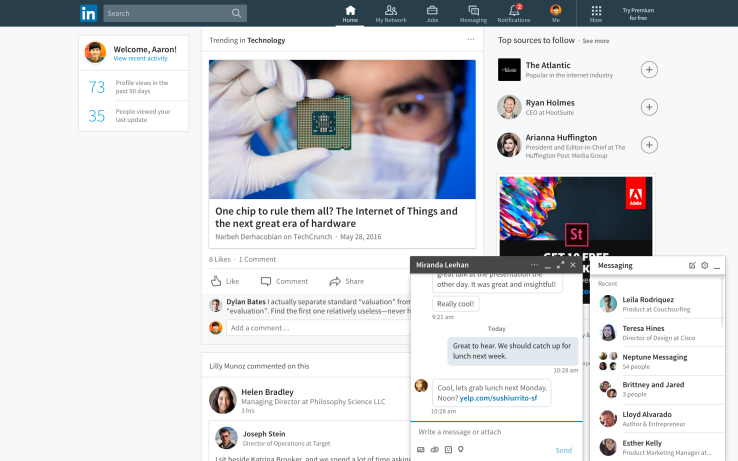 Actually, everything was different, because LinkedIn completely redesigned its desktop site. And with new features like native video and smart replies, this update continues to be important heading into 2018. LinkedIn is the world’s largest professional networking platform, with 530 million members worldwide. The company rarely discloses their number of active monthly users, but we do know the network has grown by more than 60 million total members since the third quarter of 2016. Is this a testament to the redesign? Perhaps, but there's a lot to unpack from this overhaul. There’s more to this slick interface than what you see here. LinkedIn sought to “create more value” for its members since being acquired by Microsoft in 2016, and, hopefully, make them want to spend more time on the site. Let’s dive into some of the biggest changes to the site since the redesign and how marketers and users should be taking advantage of them this year. 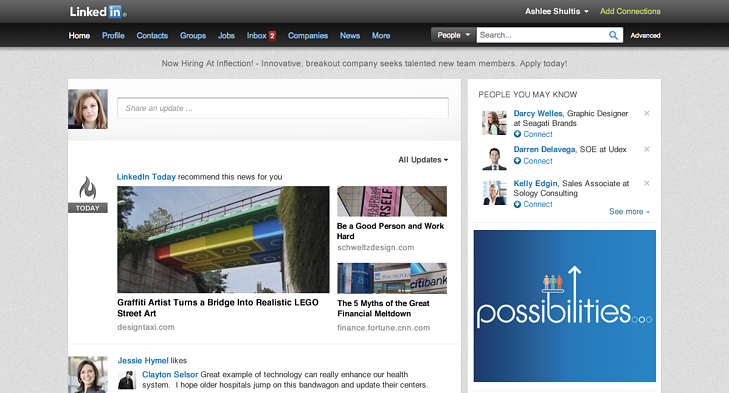 Using a combination of human editors and new algorithms, LinkedIn has surfaced more content and fewer status updates. The homepage feed will increasingly suggest organic, sponsored, and native advertising content users might be interested in reading. In keeping with this business focus, one clear addition to this layout is the "Work" button to the right of your profile picture on the new navigation bar. This is the control center for a user's company page management, making it easier to advertise, find and attract talent, and conveniently equip employees with learning solutions right from LinkedIn. These are deliberate moves to better connect professionals with the businesses they support and care about. 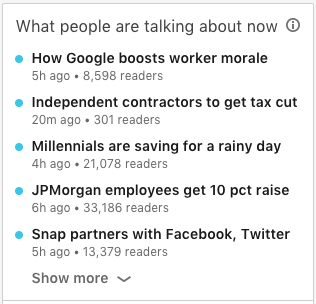 The feed will now also help users follow trending stories … sound familiar? If LinkedIn is trying to make its user base engage more on the platform, further modeling a newsfeed in the style of Facebook is a safe bet. 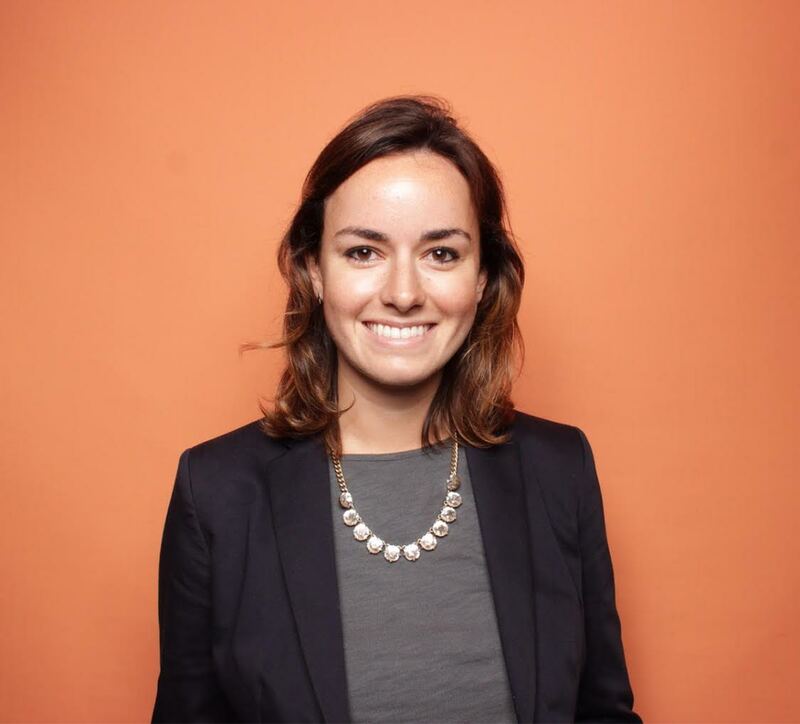 This function was seeded with popular topics picked by more than 20 editors, most of them former business journalists, and now integrates with LinkedIn's algorithm to show trends that are more specific to a user's connections and the content they engage with. Next, LinkedIn is introducing a chatbot. It will look at two connections’ calendars and find and set times for them to meet directly within LinkedIn’s messenger platform. It hasn’t been rolled out as of the time of this posting, but in another nod to Facebook Messenger and similar bots, this is an addition designed to keep users spending time on the site. Stay tuned for more news when the bot launches fully. Although a working chatbot hasn't yet gone live on LinkedIn, artificial intelligence (AI) is already making its way into the user experience -- with smart replies. Inside LinkedIn Messaging, you'll see three suggested responses below an open conversation, based on the messages that were most recently sent. Although it may not appear in every chat window, LinkedIn says it will further customize these smart replies based on the person to whom you're writing. For example, "Thanks, Danielle!" as opposed to simply, "Thanks!" As LinkedIn users spend more time connecting with businesses and colleagues, especially via mobile, we can expect AI and machine learning to make LinkedIn even more convenient in the near future. 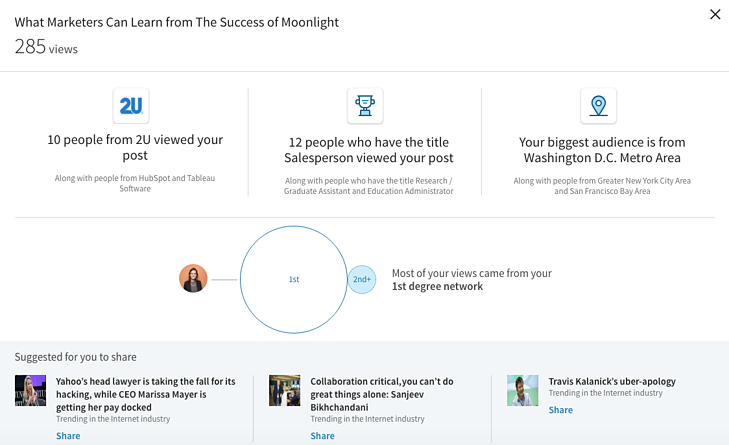 LinkedIn now provides more analytics about how other users interact with the content you share -- not just who views your profile or who likes one of your posts. 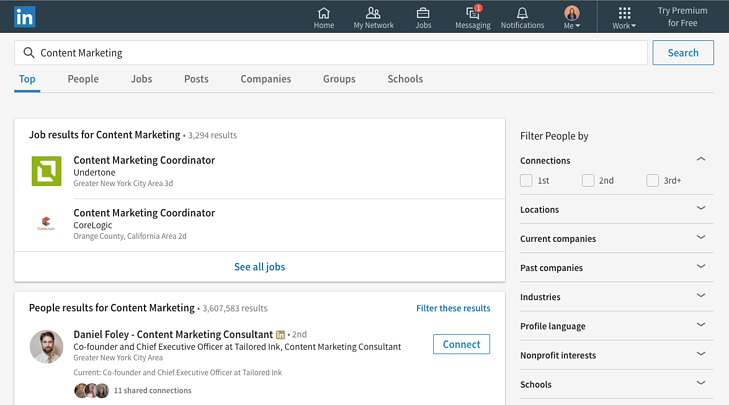 Now, users can see not only who likes their content, but which companies they come from, where they're located, what roles they’re in, and even where they found your content. There was a time when you could only embed video content on your LinkedIn page from YouTube or a similar third party. But times have changed. In a decisive attempt to keep people on LinkedIn's website, you can now upload native videos directly to LinkedIn through the LinkedIn mobile app. It's a smart move that could set the company up for features you already see on social networks like Facebook (think Facebook Live). 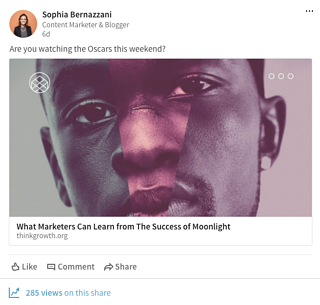 Native video also makes it easier for LinkedIn company pages to appear more authentic in their storytelling, helping individuals connect with and follow brands they know they can trust. In another nod to Facebook’s Messenger layout, this change helps users easily spend more time clicking around the site. The difference is that this chat feature has also begun to include sponsored messages. This makes business professionals less likely to send the dreaded default InMail message if they know their outreach can appear like a chat instead of an email.